"When developing the idea for my book Paris in Stride: An Insider’s Walking Guide (Rizzoli) with my coauthor Sarah Moroz, the challenge was finding the sweet spot between creating a pragmatic walking guide and a beautifully evocative representation of the timeless city that keeps drawing back dreamers, artists and tourists alike. I would have loved to have dedicated an entire guided walk to all the amazing women in the restaurant scene who have trained in Paris and opened up some of the most unique food businesses in Paris over the last couple of years. And frankly, many have been on the forefront of some of the biggest dining trends: food trucks, vegan eateries and fast/casual spots. Instead, I’ve compiled a growing shortlist of some of my favourites to support on your next trip to the City of Light." 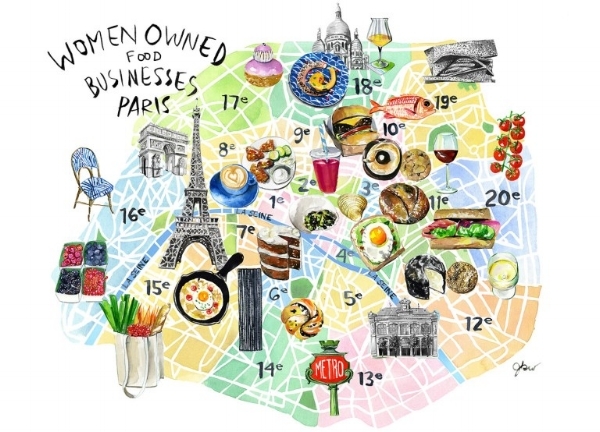 Check out Jessie's awesome shortlist of women-owned businesses in Paris here.